There is a clone for everything, so why not clone the mighty iPad itself. Meet the Zenithink ZT-180, one of the best iPad clones out there. It gets very interesting as we go under the hood. Powered by an ARM Cortex A8 1GHz processor this clone looks and feels just like an iPad however you will get a shock of your life when you notice it runs the Android 2.1 operating system! For those who had complained about the iPad’s lack of flexibility with other devices, this might bring some reprive. The Zenithink has 3 USB ports and one mini-USB port and can also function as a UBS host. It also has an expandable memory option which can be done thanks to the microSD card slot. It even has a RJ45 port for LAN access. With a nice 10-inch display and with WSVGA resolution (1024×600 pixels) this clone comes with built-in Wi-Fi and GPS modules. The Zenithink ZT-180 is also capable of playing high definition videos. It has a pretty good battery of 7 hours with WiFi off and 5 hours with WiFi on. 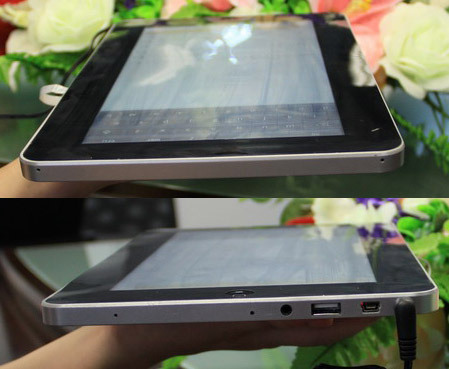 Zenithink is offering various storage options for its ZT-180 tablet – 512MB, 1GB, 2GB, 4GB, 8GB or 16GB. Thats quite a choice for you to choose from. However all this comes at a added cost and this slate is a little thicker than the iPad itself. There is no information on its price though. Chinese Duplicate? The Mini Mac clone is out!